My local Magistrates Court has been rebuilt and now has a brand new building. 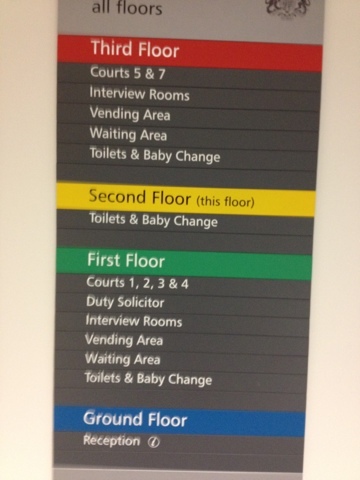 There are signs in the building to assist visitors and Court Users. The sign has the obvious omission that there is no Court 6 in the building but there is a Court 5 and a Court 7. Court 7 is in fact Court 7 from the Crown Court which is on the opposite side of the road in another building. This sign must really confuse people who have no idea why there is no Court 6. I had a busy weekend being "on call" for the Saturday and Sunday that have just passed. Being on call means that you are often called upon to deal with cases of a varying nature. Some cases are quick and easy, others are more serious and often take longer to deal with. Whilst I was out and about I received a call from a local firm of solicitors who said that they were dealing with a 3 handed case (a case involving three suspects) and that they feared there would be conflict of interest in the future, and wanted to ensure that their conflicted defendant was still represented. After a brief discussion with the other firm, the Police Station and importantly the Client, I made arrangements and went down to the Police Station. When I got to the Police Station I realised that the case was reasonably serious. An allegation had been made that my Client was in some way involved in the supply of a large quantity of cannabis. The case also seemed more serious than usual as the Serious Organised Crime Agency had been involved in the case. After taking instructions from my Client it became clear that I was dealing with a person who had been manipulated by the others who had been arrested, and, that it was more than likely he was an innocent person who was in the "wrong place at the wrong time". After we had finished the interview the Officer dealing with the case hinted that they accepted my Client's innocent account and did not think that he would be prosecuted for any matters at all. Criminal defence solicitors are increasingly paid for cases on the basis of a formula. The formula makes a basic payment for the seriousness of the offence, that payment depends on how the case proceeds (for example is there a guilty plea or a trial) and if the case proceeds to trial the basic payment is increased depending on the number of pages of evidence served by the Prosecution. In this particular case it seemed quite clear that SOCA had been following some of the people who were arrested and therefore the page count for such a case would normally be quite good. Whilst I was very happy that my Client was not charged with an offence, it was rather unlucky that I had been dealing with a Client who was not going to be prosecuted. I have no doubt that the firm that referred the Client to me made a conscious decision to hold on to the Clients that they thought would generate the bigger fees. I have moved offices. About a year ago the firm that I worked for had a bit of a management disagreement and the Crime Department left my previous firm and joined another firm. After these two firms worked together for a year I was moved from my old office in sunny Southend-on-Sea to the new City of Chelmsford. My new office location is very good. I am based in a small city that has within in it a "centralised remand" Magistrates Court, a Crown Court - and the local prison is also in the city. The Police Station for the city is currently closed for refurbishment but it should reopen in the next 12 months or so. All of the facilities that I need are right on my office doorstep and are all within walking distance. Location is a very important part of crime work. A firms office post code will determine what rotas solicitors are eligible to get on for Duty Solicitor work. In the past 5 years, or so, firms have been moving their offices about, or opening up new satellite offices, in order to qualify their firm to get on to new Duty Solicitor rotas. There is a simple economic theory that the more rotas a firm can get on to the more crime work they are likely to do. But, location can be a pain in the back side for some firms. I mentioned that my city now has a "centralised remand" Court. This means that over time some smaller Magistrates Courts have been closed as they were deemed inefficient and costly. Now there are some Magistrates Courts that are open on a daily basis but they no longer deal with "custody" cases - that is defendants who the Police have decided should be prosecuted for offences but have decided not to release those people on bail. Essex now has a system of centralised remand Courts so that defendants who are not granted bail by the Police are sent to a single Court in the North of the county, and a single Court in the South of the county. The idea of a centralised remand Court is fine for my location. But there are firms which are based outside of Chelmsford that have to send one solicitor to the centralised remand Court to deal with any custody cases, and still send another solicitor to their local Magistrates Court to deal with defendant's who are on bail. It is a common occurrence for some firms not to send a Duty Solicitor to cover their allocated slots on the Court rota simply because they do not want that solicitor to be at a Court where they could be deployed to make more money elsewhere. Apparently the Government has decided that it wants more foreign nationals to be deported if they are convicted. Whilst there is nothing wrong with a Government creating laws for the Courts to work with Theresa May's announcement is a little odd. She has suggested that if the Courts do not interpret the law in accordance with new guidelines for deportation of foreign nationals then she may have to resort to making new laws. One of the basic concepts you learn on any law course is that there is a separation of powers between the Crown (i.e. the Monarchy), the Executive (i.e. the Government) and the Judiciary (i.e. the Courts). Whilst the role played by the Monarchy is less and less important the roles of the Judiciary and the Executive are very important. The Executive create laws by passing laws which are usually in the form of primary legislation or Acts of Parliament. The Executive also make other laws using secondary legislation. When laws are made the Courts are duty bound to follow those laws and interpret them according to the will of Parliament. There are of course many times when the Courts have chosen to interpret the law in a way which seems to be the complete opposite of what Parliament intended. Now, if Theresa May is unhappy with the way in which the Courts are currently interpreting human rights laws all she needs to do is to create new legislation which tells the Courts what to do and how to interpret the law? I have not read many articles on this subject but I am confused as to why she thinks she can simply give the Courts guidance on how to do their job and expect them to follow her guidance? I have a BlackBerry that is a work phone that I walk around with all the time. The BlackBerry is always charged and even sits on my bedside cabinet overnight. I am rarely more than 2m away from my BlackBerry. 1. It is a phone and it does ring every now and then. 2. I get sent so many messages if I do not read them as they arrive I end up with 150 or so messages to read every workday. 3. I like to keep on top of what is going on with my cases and my colleagues movements. The problem with my addiction to my BlackBerry is that when I go on holiday or go abroad I feel lost without my BlackBerry. The Wife hates my BlackBerry. I was doing a number of plea and case management hearings yesterday, one of which was by video link. Unfortunately the prosecutor arrived and gave me a new indictment which rather upset the planned pleas for the hearing. The defendant was charged with one offence up until yesterday and then all of a sudden he is being prosecuted for two offences. If the hearing was not by video link I would have simply gone down to the cells and spoken to the defendant to discuss the change with his case. The problem was I had already spoken to the defendant in the prearranged conference slot before the hearing and I was given the new indictment two minutes before the hearing. During the hearing the Court attempted to connect to the prison so that the Court could see the defendant and the defendant could see the Court - but due to problems it took something like 35 minutes for the equipment to work and that was after several reboots. It would have been quicker for the defendant to be brought directly from the prison to Court when they realised that there was a problem with the equipment. When the equipment worked I had to ask the Court to for further time to discuss the recent developments and the Judge decided the quickest way to do this was simnply to clear the entire Court. The hearing that was estimated to take 15 minutes to complete in fact took some 50 minutes. Video linkl technology is supposed to speed up proceedings and reduce costs by dispensing with the costs of bringing a prisoner to Court. Yesterday was a fine example how technology sometimes causes extra delays in Court hearings. I quite enjoy watching Silk on BBC One - but it is a bit of a guilty pleasure. I have watched tonight's episode and have again seen many errors in how matters proceed in Court - but I am sure that these errors are either unintentional or created in order to make the programme more entertaining. I could not work out why evidence was being given in Martha's case when it appeared to be a guilty plea - there was no apparent issue in the facts that suggested there was a dispute that required a Newton hearing. The hearing was not a trial as there was no jury present in Court. It was just odd. In Clive's case the level of abuse between the prosecutor/defence advocates and the witnesses was terrible. There were also errors where people were questioned about their previous convictions without there being any application to seek the Court's approval to have permission to ask them about previous misconduct. Also, questions about previous sexual conduct of the victim would have had to be approved by the Court before they could be asked. Despite the errors I was still entertained. Views on Silk in the legal profession seem to be divided. Some enjoy it as I do, others find that they cannot stand to watch the programme. The Guardian has today published an article on one of my local Magistrates Courts. I was not at Court on Monday so I cannot take the credit for any of the defence representations. Magistrates Courts lists are sometimes full of what appear to be relatively mundane cases. Each case has it's own story which is very important to all parties involved in the case - that being the defendant, the victim and those who represent those individuals. Each case would have been a battle that was hard fought on either side. What is described in the article is "bread and butter" work and represents what defence solicitors and prosecutors do day in and day out in Magistrates Courts up and down the country. The Solicitors Regulation Authority is running a free webinar on Quality Assurance Scheme for Advocates where solicitors can earn one free CPD point. If you are interested in a free CPD point follow this link. Last year I dealt with a plea and case management hearing where I had an informal chat with the CPS lawyer. The case was odd in that it involved a scuffle in the street with a knife. The case was odd because the people directly involved in the scuffle had not given witness statements and the only person who was involved in the scuffle and the proceedings was the Client. Witnesses had provided statements suggesting that my Client had been attacked by two men, other witnesses suggested that my Client had attacked the two men. My firm had written to the CPS suggesting that they should not continue to prosecute the case because their evidence was contradictory and the Client had a valid defence for having the knife. When I got to the plea and case management hearing the Client was wavering and suggested that he wanted to plead guilty despite his defence to try to reduce the risk of being sent to prison. I spoke with the CPS lawyer and asked if the CPS were considering dropping the case and was told that they were going to continue. The Client pleaded not guilty and his case was adjourned for a trial. I later found out that the CPS lawyer had been concerned about the case but decided to continue because he had heard me mention at an earlier hearing that the Client may consider pleading guilty to bring the case to a swift end. When the case was listed for a trial I made sure that my diary was free so that I could do the trial as I felt I had an obligation to finish the case off as my comment appeared to be one reason why the case was continuing. I am pleased to report that my Client had a trial and was eventually found not guilty. I sometimes wonder if my input in to cases does have a real impact which changes the outcome of a case in a positive way. I would like to think that my decision to finish the case had a real input in securing the acquittal of the Client. I have not posted anything here for a long, long time. Where have I been? Nowhere really, I am still doing criminal defence work in Essex. Things have changed in my world. I was working for a firm of solicitors which faced the prospect of imploding due to differences between the Partners and the direction they each wanted to take the firm. I am very pleased to report that my entire criminal department got up and joined an existing major crime firm in Essex. The world of crime has remained very similar - there are still too many people out there chasing a ever decreasing pool of money to make a living. The government is still hell bent on cutting fees for legal aid work. My work has diversified. I am now spending more time in the Crown Court than anywhere else. I have prosecuted cases in behalf of a local Council. My firm has also become a preferred supplier to prosecute Probation breaches in the Crown Court. If people are still out there reading this blog then I will carry on posting about the murky world of a criminal solicitor.